Miles King, 40, and Chantele Armstead, 29, were arrested on drug charges and outstanding warrants. 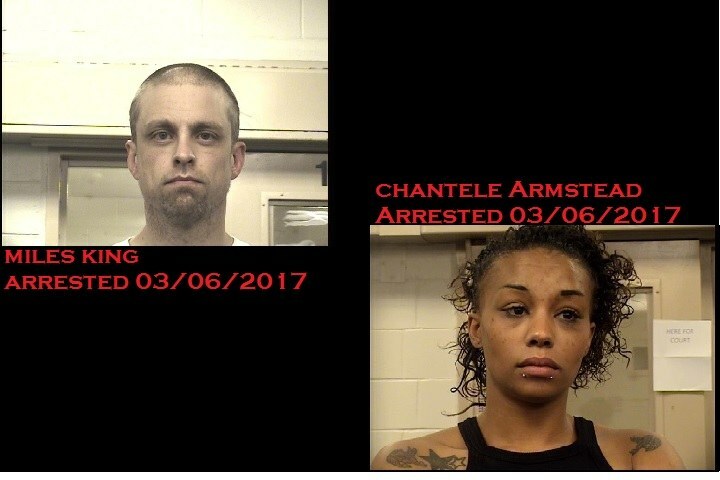 The Albuquerque Police Department Narcotics Unit received information that Miles King and Chantele Armstead were selling stolen firearms, meth and heroin throughout the Southeast Area Command. On March 6th, the APD Narcotic Units concluded with their investigation on both King and Armstead. Detectives eventually had enough information to obtain a search warrant for the residence the two were staying at, this lead to King and Armstead being arrested. During the course of their investigation detectives recovered 3 firearms, with 1 of them being a reported stolen firearm. Detectives also seized Methamphetamines and Heroin also located during the search. King was charged with Trafficking a Controlled Substance, Tampering with Evidence, and Possession of a Stolen Firearm. Armstead was arrested and booked on outstanding warrants. Both were booked into MDC and are currently still in custody. The APD Narcotics Detectives did an outstanding job on this investigation and removed two more drug dealers off the streets of Albuquerque. Due to their excellent work the Meth, Heroin and firearms will not be able to be used to harm anyone in the community.